Hydrogen- and solar-powered vehicles are on the streets. So are cars that can get you through stop-and-go traffic while you sit back and send texts from behind the wheel. Cars are even using radar, ultrasonic waves and cameras to jump into the passing lane and get around slowpokes. Sure, all of these technologies are still in the testing phase, but that hasn't stopped car makers and technology companies from showing off a new paradigm of driving at the International CES gadget show this week. It's a world in which you no longer grip the wheel with excitement, but instead relax with a book or movie as your car chauffeurs you to your destination. That was the point of one simulation by Delphi Automotive PLC, a provider of auto parts and technology to major manufacturers including Ford, GM and Volvo. The scenario, using a stationary but souped-up Tesla Model S, imagines "autonomous driving lanes," much like carpool lanes today. The company imagines that vehicles might someday enter these lanes and then run on auto-pilot. The feat is possible today with a mixture of technology that keeps cars inside lanes and adaptive cruise control that matches a car's speed to the vehicle in front of it. While in the autonomous lane, the car's window glass frosts up and functions that had been disabled for the driver—like video playing from a mini projector—turn on. 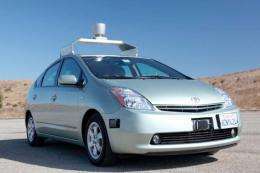 The driver can pursue other activities, like surfing the Web or even taking a nap. When the driver's exit nears, the car gets increasingly persistent, demanding that the driver take back control. First, the video player stops. Then a female voice intones, "Place both hands on the steering wheel and look ahead in the driving direction." Finally, the seat starts vibrating and a driver-facing camera ensures he or she is looking at the road. The driver taps a steering wheel knob, takes control, and drives on. The experience is similar to airline pilots who grab the controls for take-off and landing but let a computer do the rest. "These technologies exist now and the carmakers assure us they're ready to go," said Jim Travers, associate editor of autos for Consumer Reports magazine. "It's really not that far off." Though technological innovation isn't an issue, there are many speed bumps on the road to this envisioned future. Consumers must accept the safety and reliability of such systems, governments must draft and pass legislation and the insurance industry needs to draw up guidelines to answer tricky questions such as who'd be at fault in the event of a crash. "That's one of the biggest issues for the industry as a whole for autonomous technology," said Glen De Vos, vice president of engineering for Delphi's electronics and safety division. "The legal environment has to keep pace. Today we're at the very beginning." Not ever in my car. One fried transistor and all hell will break loose. Don't let lawmakers give these companies any breaks on liability.!!! How is this not your shtick?